Grab an 8" x 8" or 9" x 9" casserole dish. Mix the 3 T of the whipped cream cheese with the 3 T of chives. Slice the bagels in half (like you are going to spread something on them) if they are not already sliced that way. Cut the bottom halves into thirds. 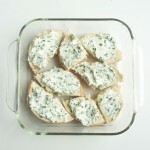 Spread the chive cream cheese on each piece, placing them in the casserole dish as you go. Fit them together like a puzzle, and use all of the chive cream cheese you have mixed. 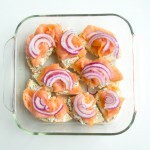 Divide the 3 ounces of lox into 3 piles. Taking one of the piles (one ounce) and eyeing 3 of the bagel pieces, tear the lox with your hands so the pieces fit neatly on the bagel thirds. 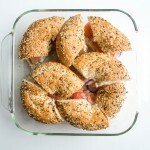 You are using one ounce of lox for 3 bagel pieces. Top the salmon with a bit of red onion (it won't be as strong as raw onion would be on a sandwich, once it has baked for an hour), and then one small slice of tomato per bagel piece. 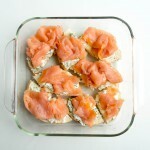 Cut the top halves of the bagels into thirds, and spread on the remaining 3 T of whipped cream cheese. Arrange the bagel tops on the sandwiches you have assembled in the dish. In a large bowl, whisk together the eggs, milk, dill, and capers. Pour the whisked mixture into the casserole dish. Cover the dish with foil, sealing the edges, and press down, to make sure the egg soaks into the top layer of bagel a bit. In the morning, heat your oven to 400. Give the foil one last press, and then take it off. Bake the casserole dish uncovered for 20-30 minutes, until the egg starts to cook at the edges and the bagel starts to brown. Place a loose piece of foil over the top, to stop the bagels from continuing to brown but allowing the egg to continue to bake. Bake for another half hour. Check on the casserole by pressing down on the middle with a spatula. If liquid egg seeps out, give it another 5 minutes. Once the egg has set throughout the casserole, serve to company, or enjoy yourself! The photos for this recipe show 8 pieces of bagel - if your bagels are larger like mine, and all 9 pieces won't fit in the dish, enjoy the benefits of being the chef!